Venice is gearing up for the Biennale with a whole host of exhibitions opening up around the city. 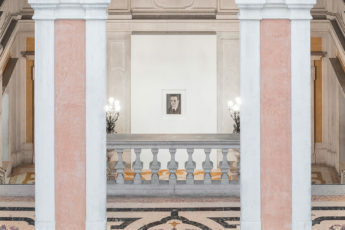 One of the most interesting is La Pelle by Luc Tuymans at Palazzo Grassi, François Pinault’s gallery on the edge of the Grand Canal. The exhibition is extraordinarily wide-ranging with more than 80 paintings on display from 1986 right up to Tuymans’ most recent works. The title, which translates as ‘skin’ in English, takes its name from the infamously controversial novel by the Italian writer Curzio Malaparte, set in Naples at the tail end of the Second World War. War is a theme that permeates Tuymans’ work too, or more specifically the horrors of Nazism. The first artwork visitors come across is a giant floor mosaic of pine trees, based on a painting that the Belgian artist made outside a German labour camp at Schwarzheide. Vertical lines cut through the composition in representation of the way prisoners tore up their drawings to hide them from the guards. Overlooking the mosaic is a small portrait of Albert Speer, the chief architect of the Nazi party. Many of the artist’s works are based on secondary images, such as photographs taken from a television screen, YouTube or Netflix. Tuyman’s paintings favour bleached-out colours, giving the work a spectral quality as if the images are fading right there in front of your eyes. And the show is haunting in the sense that it will stay with you long after you’ve wandered back down the grand staircase and into the Venetian sun. 2015 ‘Isabel’, Luc Tuymans. Photo credit Studio Luc Tuymans.